This drive is made specifically to serve your mobile fix, and will be of particular interest to iPad owners. 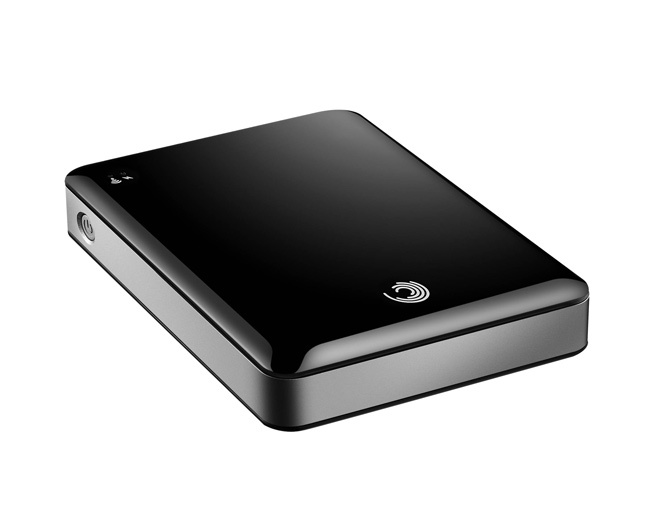 Seagate’s GoFlex Satellite is a 500GB drive with a Wi-Fi radio inside. Connect to it wirelessly wherever you are and partake in the movies, shows or music stored within. You hook it up to your computer using USB (it acts just like a standard hard drive) then fill it up with media files and charge the LithiumIon battery inside. Then, you pull the USB assembly off the back and carry the drive around. When you want to watch a movie or listen to some music, you plop the drive on the table in front of you and turn it on. Whip out your tablet or phone, then switch your connection from your regular Wi-Fi network to the ad hoc network created by the drive. To access your files, you can use Seagate’s free app for iOS, which has a nice embedded player for watching the videos and playing the songs stored on the drive. Android users (and anyone else) can use the web browser. The battery lasted about 4 or 5 hours in our testing, and there’s a car charger in the box for keeping it alive during road trips. The Seagate player app was mostly painless to set up and use on an iPad. One hiccup — the Satellite is an NTFS volume, and works flawlessly on Windows PCs. But if you’re a Mac owner, you have to install a small piece of commercial software (from Paragon) on your main computer that gives you NTFS read/write capabilities. Otherwise, the drive is read-only on a Mac, and reformatting it cripples its functionality as a Wi-Fi drive. You can side-step this limitation using free software or command-line tools, but our mileage with those varied. So if you have multiple Macs in your house, it’s a struggle to load files onto the drive from any computer that doesn’t have Paragon’s NTFS tools installed. The drive comes with one Paragon license, but additional licenses are $20 each. On a Windows PC, this headache is non-existent. Still, these issues keep us from recommending it to less-techy users — nerds only! WIRED A go-anywhere “real” storage device built for iPad, iPhone and Android. USB 3.0. 3-year warranty. Internal Wi-Fi lets three different people connect to the drive at once. Makes you look smart for going with the 8GB tablet instead of the 32GB version. TIRED If your tablet is Wi-Fi only, you have to disconnect from the rest of the world to access your files. NTFS-formatted drive means headaches for Mac compatibility.